Cecil Clarence Cave, circa 1910. 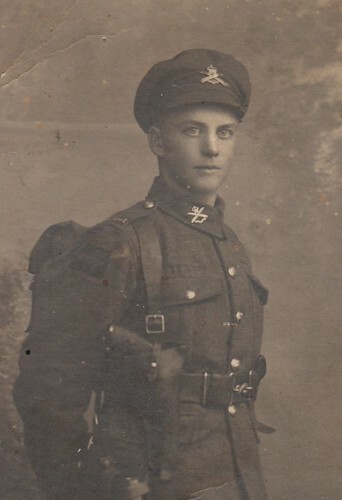 This is my father on his way to World War 1. 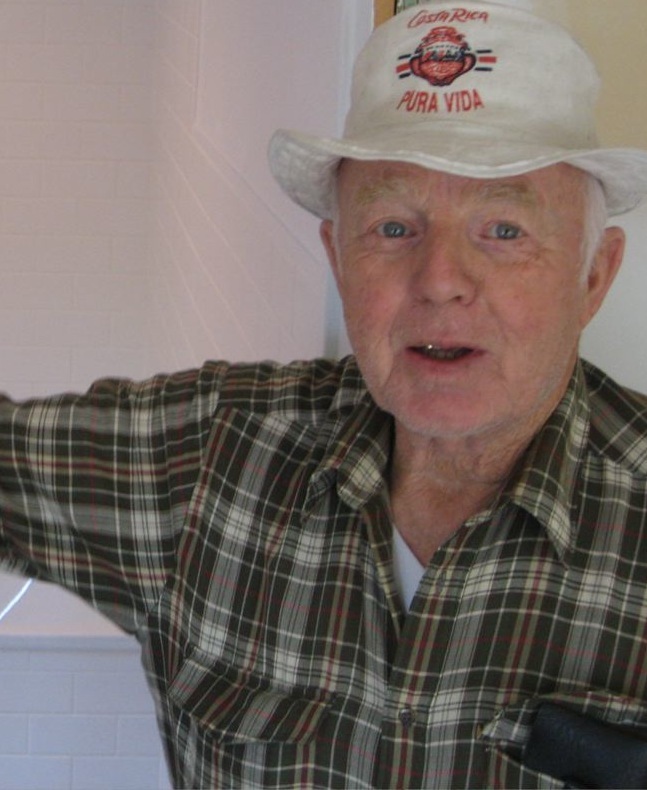 When he came back he settled in Northern Saskatchewan and had ten kids. You can see seven of us, me and my brothers, in the next picture. I also have three sisters, but they were not photographed. We got all dressed up for this picture, and my older brothers are wearing ties. Farming didn't work out too well, it was the Depression. We moved to the coast during the Second War. We settled on a farm outside Langley, and I went to Otter Road School. Here are some more pictures from those times. There are pictures of my sisters too, especially Lillian and her family who I often stayed with. 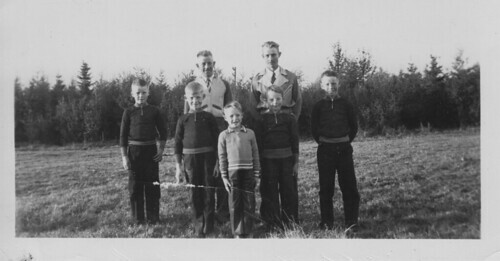 The Cave Brothers, Winterbourne Alberta, circa 1944. GF Cave, age about 16. When I was about 15, I was in grade 8 at Langley High School, and that was my last year at school. 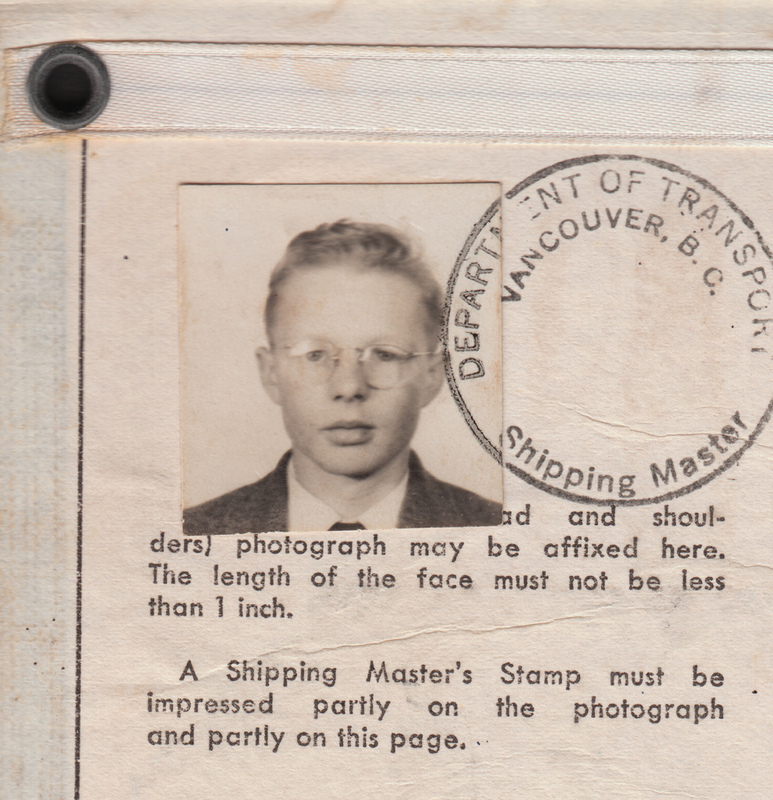 Then I joined the Canadian Merchant Marine like my older brother Gerald. According to my identity cards I weighed 106 pounds! I started out working in the galley, which was great because there was lots of food around. Then I trained in the officer's mess, and later worked in the passengers dining room. We worked up and down the coast from Vancouver to Juno and Skagway. Sometimes we made great friends with the passengers. There was time for shore leave too, and here is a picture of me and my friends going hiking up a frozen river. 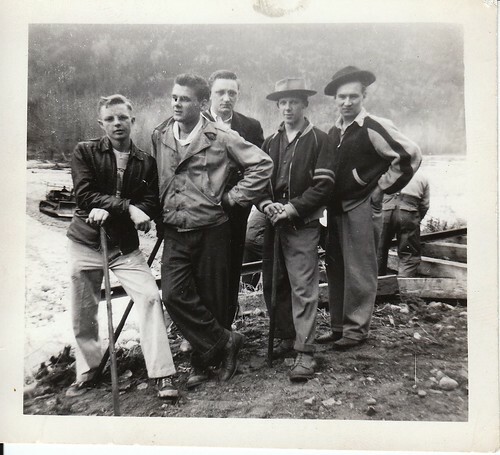 A hike up a frozen river for shore leave near Skagway, Alaska circa 1948. GF Cave is first on the left. All aboard! here are more pictures of life on the SS Princess Norah. I worked on the BC ships for about 4 years, and then went to Montréal to work there. But the Québec union wouldn't let me because I wasn't local. I started hitch-hiking home and went to Saskatchewan to visit Lillian. Then I stated work at the Potash Company of America. I did a bunch of other kinds of work on the praries. Eventually I met my wife Doris Switzer in Saskatoon. GF Cave, age about 30. In 1956 I got married and moved to Alberta. By 1962 I had 2 kids and was heading over the mountains to Vancouver where we settled down.
" … I wanted to get into a class for welding and small motor mechanics. 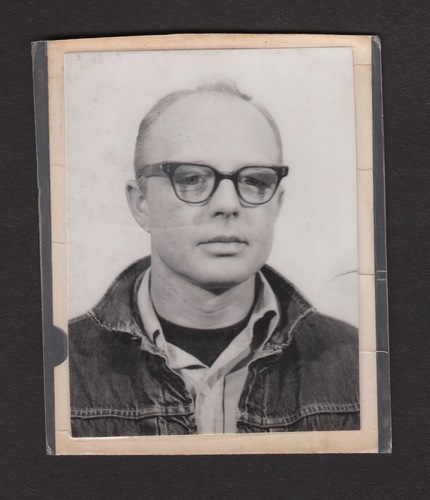 And I went out to Haney Correctional, they said we needed 12 or so students … I was working at ESCO (Electric Steel Company, a foundry in Port Coquitlam) in shifts. And when the course started I got changed to an afternoon shift, 4:00pm to midnight, and I could't go. 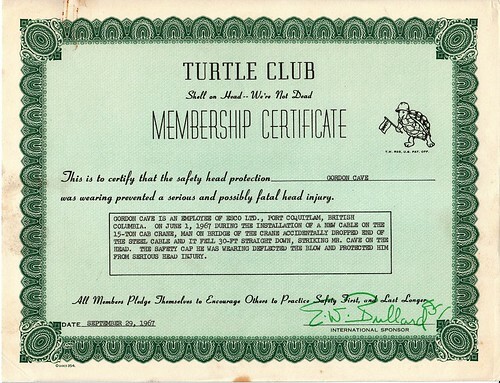 But I still had this photo identification to get past the guard at the gate … "
I survived a hard knock on the head, and now I'm in the Turtle Club! 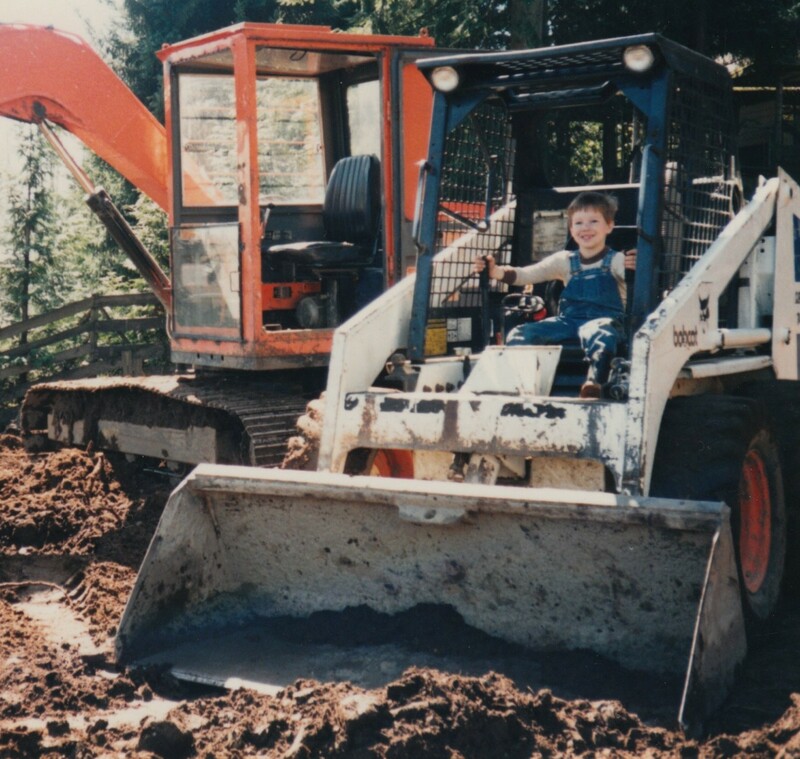 In the 1970s I got my first Bobcat, and I loved it. 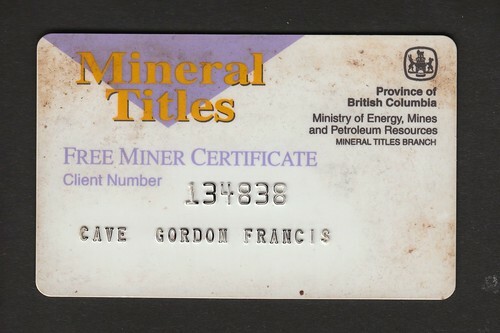 I quit my job at the Electric Steel Company, and started GF Cave Excavating Ltd. The business lasted until my retirement in the 1990s. There were lots of great trucks and interesting machines. Here are some more pictures of Bobcats! I worked with my friends Leif Sogaard, Tom Hyacinth and Ferdinand Maheux on all kinds of building projects everywhere around Vancouver. 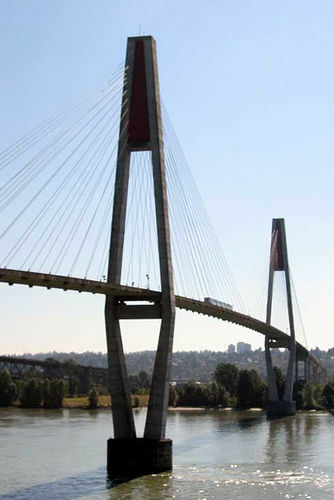 One of my favorite adventures was working on the Skytrain transportation network. Here are some pictures of me going all out to build the Skybridge. Here are some pictures of me on some prospecting trips. My favorite was an especially a good one flying around the Yukon with my brother Toby. 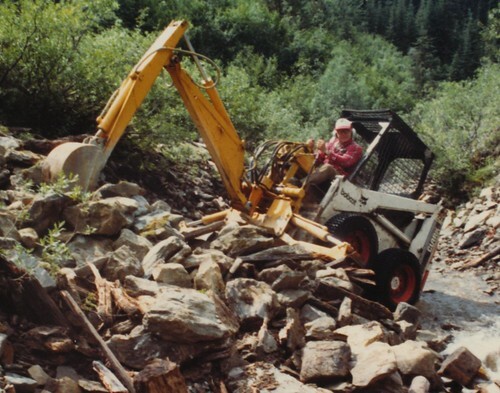 Placer Mining on Ahbau Creek, north of Quesnel 1995. Here is a picture of when I visited my son who was working in Costa Rica around 1993. When I was there I saw plenty of alligators, a three-toed sloth, and sea turtles laying eggs on a Caribbean beach. GF Cave, age about 74. Around 2005, before my first heart attack, I was spending three or four days a week in Vancouver visiting my many friends on Commercial Drive. Lunch and coffee breaks were extended to about three hours per day. This shot was taken during some home renovations.